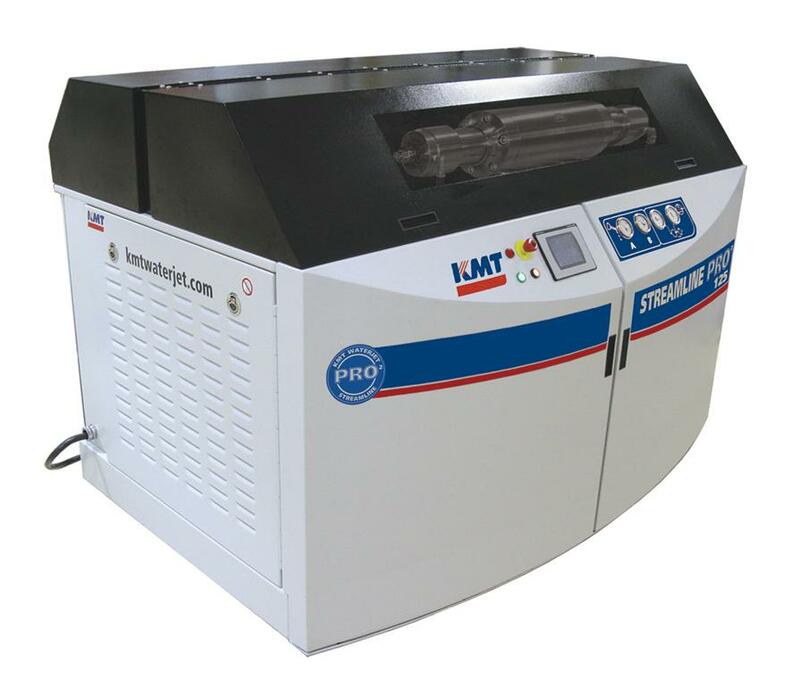 With the introduction of the high pressure pump series STREAMLINE PRO, KMT Waterjet Systems was able to increase the maximum working pressure of waterjet cutting machines up to 6,200 bar thereby extending the application areas of this technology. Now, the company launches the ultra high pressure pump STREAMLINE PRO-2 – the successor model to the successful pump series. Along with the well-known top-level performance, the new pump model features simplified and thus time-saving maintenance. Waterjet cutting at 6,200 bar has many advantages compared to conventional 4,000 bar applications. Particularly when cutting very thick material, the extremely high working pressure allows for increased efficiency as well as for improved cutting edge quality and conformality. Therefore, the cutting edge of a workpiece normally does not have to be reworked. Moreover, depending on material type and thickness, the cutting speed can be increased by up to 50% – in some cases even more. 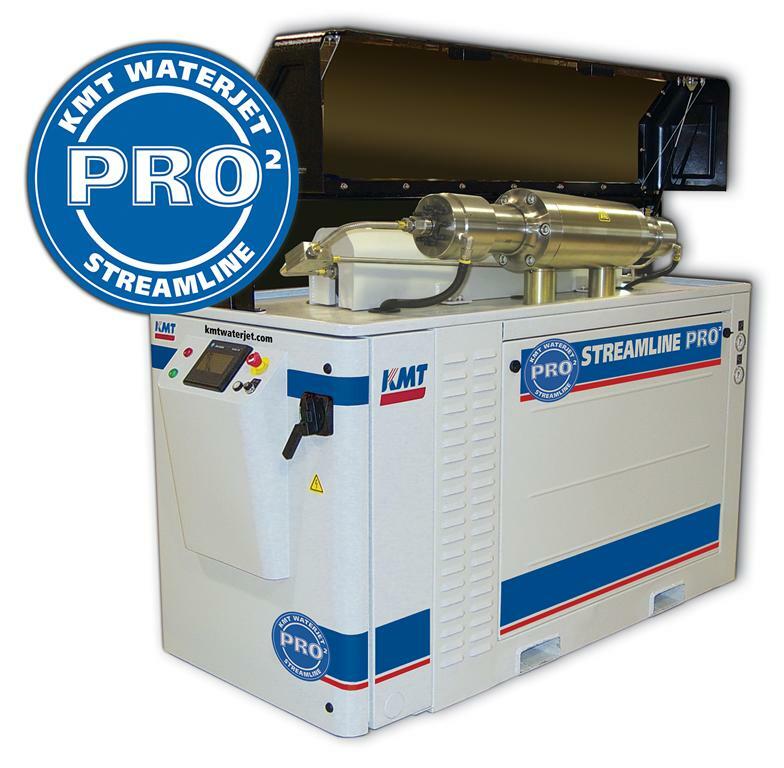 With the high pressure pump series STREAMLINE PRO, KMT Waterjet Systems enabled cutting with 6,200 bar in the first place; with the development of the model STREAMLINE PRO-2, the company can further increase the efficiency of the pump. For the new pump generation, KMT’s engineers have developed the Rapid Change Intensifier, whose design significantly simplifies maintenance and repair. For example, worn out seals can be replaced in no more than 20 minutes. This is made possible by the fact that the intensifier completely does without a complex construction for the positioning and sealing of the seal head. The new patented design reduces both the effort necessary for the disassembly and assembly of the intensifier and the amount of single components to a minimum. The same is true for the application of special tools which are necessary for a seal replacement. Additionally, the durable components and the long reciprocal stroke rate result in longer lifetimes for the seals and other wear parts. In combination, these improvements lead to a significantly reduced maintenance effort and thus to longer uptimes of the whole pump. In this way, the operator can save costs and increase productivity. Proper operation and service of a high pressure pump for waterjet cutting extend the lifetime and reliability of the machine thus making the business of operators of waterjet cutting machines more efficient. With every new purchase of a pump, KMT and their certified service partners offer a thorough operation and service training giving future machine operators valuable insights into the functionality of the pump. This enables them to carry out repairs due to wear by themselves and increases safety at work. When it comes to service and maintenance, KMT and their certified partners can fall back on decades of experience and a global network of qualified service technicians. With the purchase of a KMT pump, this knowledge is passed on to the company’s customers via in-depth operation and service training courses: The company and its partners regularly run group or individual trainings in multiple languages, which cover all aspects of the pump technology and take up to ten hours in duration. The content is always adapted to the level of the participants’ engineering ability so that every participant will become a capable machine operator. This increases the pump’s lifetime as well as the safety at work.